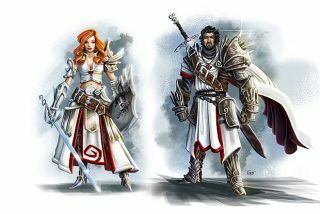 The Kickstarter for co-op enabled, isometric RPG Divinity: Original Sin has concluded with a bit shy of $950,000 raised. Factoring in donations from all sources, such as PayPal, Larian Studios has passed $1 million and met every announced stretch goal. Said goals include a full orchestral score, expanded NPC companion depth, and a player homestead. The team released a Kickstarter retrospective video, which you can check out above for a look into how these crazy crowdfunding things all the kids are talking about actually get built. Speaking of building, when the game ships (tentatively scheduled for this November), it'll come with access to the same editor the team used to make the game—one of the first prominent RPGs to do so since Neverwinter Nights 2. Scroll through all of the other info on the game and what the backer money allowed Larian to add on the Divinity Kickstarter page .